Say no to old-fashioned with our Smoky Spanish Chicken Recipe! 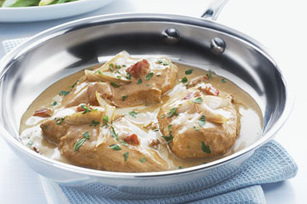 In 40 minutes, this Spanish chicken recipe yields four servings of creamy, garlicky chicken. Heat half the oil in large nonstick skillet on medium-high heat. Add chicken; cook 3 to 4 min. on each side or until browned on both sides. Remove from skillet. Heat remaining oil in skillet on medium heat. Add onions and garlic; cook and stir 5 min. or until crisp-tender. Stir in flour and paprika; cook and stir 1 min. Add broth and tomatoes. Return chicken to skillet; cover. Simmer 15 min. or until chicken is done (165ºF). Add cream cheese spread; cook 2 to 3 min. or until melted, stirring frequently. Stir in chives. Serve with a side of roasted vegetables. Serve over hot cooked brown rice or whole wheat pasta.